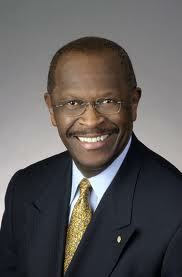 Herman Cain is a hopeful candidate for the Republican nomination for President. Herman Cain research paper due and don’t know how to start it? How about like this? Herman Cain was a hopeful candidate for the Republican nomination for President. He made a name for himself in the food industry after a hardscrabble upbringing in Atlanta. After being named CEO of the underperforming pizza chain, Godfather’s Pizza, Cain turned the operation around and was named President of the National Restaurant Association. The lobbying position brought him into political circles and, in one memorable instance, he criticized President Clinton on Health Care during a town hall meeting. The centerpiece of Cain’s election bid is his 999 economic plan. The numbers in question refer to his tax plan: create a 9% business flat tax, a 9% individual flat tax and a 9% national sales tax. The hoped for outcome is a replacement of inefficient tax laws with ones that will create $2 trillion in GDP growth, 6 million new jobs, 33% more investment and wages by a tenth. Elsewhere, Cain is indistinguishable from his Republican cohorts: he would increase defense spending, slash other federal spending, clamp down on immigration, increase domestic oil drilling, repeal Obamacare, privatize Social Security and Medicare, remove existing regulation in the financial industry, get rid of the Department of Education and re-instate the role of religion in American society. Cain identifies himself as a “Black Conservative” and has told reporters on several occasions that most African Americans are Democrats because they have been “brainwashed”. Cain has been similarly defiant on his grasp of foreign affairs, responding to one reporter: “When they ask me who’s the president of Ubeki-beki-beki-beki-stan-stan, I’m going to say, ‘You know, I don’t know”. United States Immigration research papers examine immigration from the discovery of the New World to todays current immigration. The Affordable Health Care Act - Affordable Health Care Act research papers examine the legislation, passed by Congress in 2010, to increase the availability of health insurance and access to the health care system for millions of American citizens. The Affordable Care Act - Affordable Care Act essays examine the first major overhaul of the U.S. healthcare industry since the introduction of Medicare and Medicaid in 1965. Social Security System research papers discuss the approaches to the current system. Defining African American Culture - Defining African American Culture Research Paper explore the African American's history, development, and distinguishing characteristics. The Wall Street Protests - Presidential Election 2016 research papers discuss the upcoming election and the candidates from the Republican and Democratic parties. John McCain - One John McCain term paper pointed out that during the 2000 campaign, Republican candidate John McCain was able to raise $1 million in campaign funding. Obama vs. McCain - Barack Obama is the Democratic candidate and John McCain is the Republican. Obama's Education Reform - Research papers are often assigned on the fact that President Barack Obama initiated a number of public educational reforms during his first term. Presidential Election 2016 research papers discuss the upcoming election and the candidates from the Republican and Democratic parties. Internet and Election Campaigns - Internet and Election Campaigns research papers discuss an example of a paper order placed on a historiographical essay. Voter Participation research papers measure political attitudes by the number of voters that participate in an election. War on the Middle Class - War on the Middle Class Research Papers examine its affects on the American dream, with a specific source requirement. Condoleezza Rice research papers explore her biography and her position in the Bush Administration. Paper Masters writes custom research papers on Herman Cain and look at a hopeful candidate for the Republican nomination for President.